Although these pngs include the half height images they are compatible with existing dat files. I've not posted my modified dats as they won't be of general use yet (and if people want them they can get them from my other threads anyway). I'm gradually working through rest of ways, will post more here when they are done. Hmm - I'm thinking of adding different types of canals at some point. How easy would it be to modify canal .png/.blend files for your half height system? Look at the blend files to see the height required. It's similar to the halfway lock water height on the current slopes (but not quite). Thank you. Actually, I'm more interested in simulating the various different widths of canals that existed in the 18th century (and the different sizes of boats to go on them) to give much more depth and interest to what might be called the "canal phase" (1750 - 1840s, but with some lingering to the late 19th century and beyond), although ship canals would be useful, too. All roads have had graphics revamped - with special attention to ensure that they tile seamlessly, on level, round corners, over junctions and up slopes, both double and half height. While the new textures are similar to old ones bridges, crossings and tunnels will also need updating as a result of this. Helper blends (there is much pixel editing though), textures and rendered pngs included in zip. Also there is a generic snow picture which can be overlayed ontop of any road to keep things consistent (it's black and white, in the GIMP set black to alpha on this picture then copy and paste it over summer pictures to get instant winter ones). Again I've not included dats for the half height versions, but all images will be compatible with existing dats (you just won't see the half height images in game of course!). I love the new roads - these are rather splendid! One small issue, however: the lightning symbol in the icon for DC Fourth Rail is the wrong colour: it is the same colour as the tracks rather than red. The new Roads are Cool! One small issue, however: the lightning symbol in the icon for DC Fourth Rail is the wrong colour: it is the same colour as the tracks rather than red. Thanks for that - don't think I altered this so is it a fault in the original? All the sources are from github. Thanks for these - let me know if you are short of any blends for way files and can't find them on github. You may also need my xcf gimp files for the bridges. What's the status of half-heights and the main exe? I hope it makes it in. I think half height slopes would look much better for trains in particular. PS Great to have new graphics from you - it's been a long time since a kierongreen addition to the pak, but very welcome! Just added to SVN. Half height: not in trunk at present. Unknown if/when it will be put in, I know prissi has been busy lately and there hasn't been many updates in general. Maybe more graphics will get done in time, but I'm working long days at the moment so doesn't leave a lot of time for coding or painting. I've redone all rail types now apart from TGV - these can be downloaded here. This zip has images for Wrought Iron, Wrought Iron Improved, Wooden Sleeper Steel Rail, Wooden Sleeper Steel Rail Improved, Concrete Sleeper Steel Rail and Concrete Sleeper Steel Rail Improved (they all share the same snow images which has already been done, and is also included). The colours aren't a 100% match for original versions but they are extremely close (they should only differ by 1 or 2 for each 8bit colour value). I've included new versions of the road and narrow gauge images I did a couple of months back - with special colours removed so they can be used at night! Excellent. I've not got the TGV as a blend, and AEO produced all of the maglev stuff in sketchup - I only have the images. I'll attempt to make some blender editable files this week. I've now added what's been done so far to SVN. Hopefully these are easy to edit, since they use many components. I couldn't save the texture to the model properly, for some reason, so it's separate. Colours, hopefully are there, but if they're not, then I've also included the exact colours. what does it support? I run them through meshlab and can output it as 3ds, ply and a bunch of other formats. edit: intersection broken down into straight and diagonal extra files, just in case components have been obliterated. Looking at filenames and quickly at geometry am I right in thinking that you have half height versions already in there? yes, I have done the half height models already. The only thing that would be required are assembling the various intersections by combining the straights and diagonals. Great Hopefully will get a chance to look at this again later when I'm home. Excellent news that this is progressing. Unfortunately I think the TGV tracks blend file is permanently lost - I've never had a copy of it at least. They might need redrawing from scratch. I'm looking to include jamespetts' cast iron and plateway graphics - I'm assuming these don't have half height images yet. Did you make the various tracks from a recolouring of the gimp files or some other method? The plate ways, I think, somebody else drew. The fast iron tracks are just re-coloured in the Gimp from the plate ways. The standard rail tracks are recoloured in the GIMP yes (details given above). Super that the development from new graphics go forward. I'm working on a replacement TGV track so we can add half heights and elevated ways (we had lost the blend file for the original). There are a few differences as I haven't re-engineered it perfectly. Here's a preview - any comments before I start using it more widely? Should there not be some visible sleepers, even on high speed track...? See here and here. The existing graphics didn't have at all clear sleepers and indeed I missed them until I looked closely. How about this instead? I've raised the ballast in the centre so the ballast covers the middle of the sleepers to distinguish from existing tracks. Most pictures I've seen of TGV track seeem to have covered sleepers in the middle. Also sleeper spacing should be less - more sleepers per tile for more robust track. As in sleepers closer together? 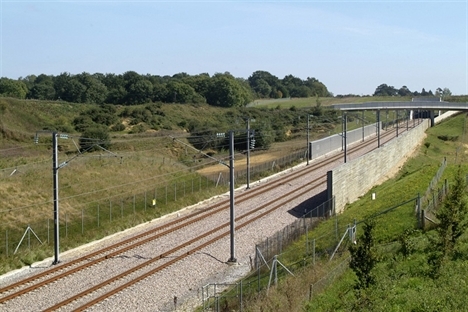 The Rails in those photo it the typ french highspeed rail. The British rail buy those typ of rails from the French.